PHOTO: Rick Toone, Steve Sjuggerud, Mike Dawes. It is such a joy to get time with dear friends, especially involving music. When Steve Sjuggerud invited me to visit him in Florida this past week, it was an immediate yes. The occasion was a live performance featuring Steve, Dan Ostrowski (drums), and acoustic guitarist Mike Dawes. Mike was visiting from UK, enroute to tour dates of his own. Also, we would be filming video…of the live performance, plus interviews. The next several days were just Mike, Steve, and me hanging out and testing guitars. Steve owns a stunning collection of original iconic vintage gear, lovingly curated, in perfect playing condition: Trainwreck, 1969 100-watt Marshall, Fender 1959 Strat. Plus some of the best new gear: Gil Yaron 1959 Les Paul replica, 1964 Fender Tweed replica, Blug amplifier system. Essential benchmark guitar tone references. Against them, we would be comparing two Goshawk™ 6-string prototype guitars I’d just completed. Mike and Steve ripping together through Iron Maiden’s “The Trooper” at concert volume still has me grinning ear to ear, a few days and a few thousand miles later. PHOTO: Steve works through pickup coil combinations on Goshawk™ 6-string. PHOTO: Rick Toone original prototype 6-string (2012). 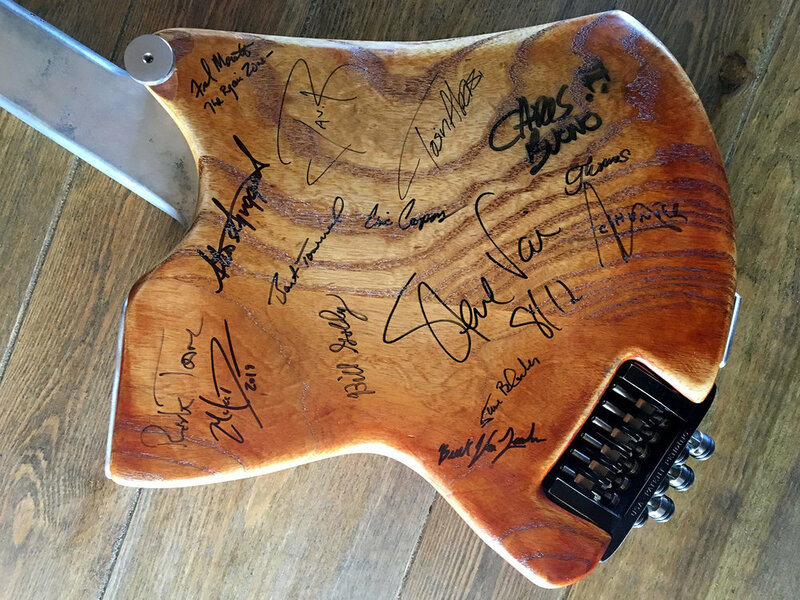 Signatures of those who have played or helped develop this guitar. Note early patent pending tuner. PHOTO: Rick & Steve, mid-testing. PHOTO: Steve looks on as Mike explores Blueshift™ 7-string ER. Antares 6-string in foreground. Photographer Adam King works the angle. PHOTO: Our location…overlooking a tidal marsh, Florida coastline.